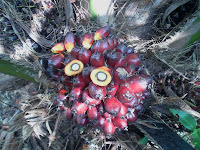 Yesterday I spent the day harvesting some ripe oil palm fruits at my eco-farm. Most fruit bunches are still small because the trees are barely two the half years old. At the picture ( inset) the cross section of the fruit shows a thick yellowish pulp, a thin shell containing a white fleshy core . Presently the average diameter of the fruit is 2.5-3.0 cm. which is considered still small. High quality oils are derived from the fruit pulp and the kernel of the seed. Notice how close to the ground the fruiting heads are. The variety of oil palm planted here are of the Elaeis guineensis, GH 500 series. In Malaysia the oil palm parents here originated from Africa. 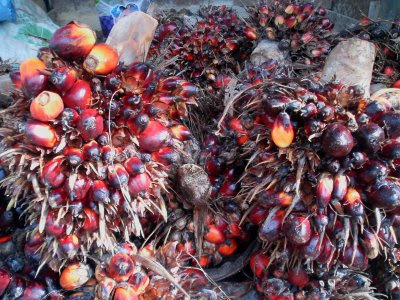 Thus sometimes the oil palm Elaies guineensis is called African Oil Palm. Oil palm trees thrives in Bintulu due due its tropical climate,ideal soil type and hilly topography. 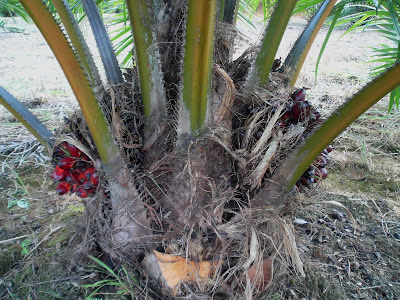 Once established oil palm trees are hardy and will bear fruit for the next 20 - 25 years. I would say my pension lies in the trees. Yesterday's harvest totalled 120 kilos. The present market price for fresh fruit bunches is RM 350 per tonne. By the trend of things, next month I would be able to harvest about 200 kilos. 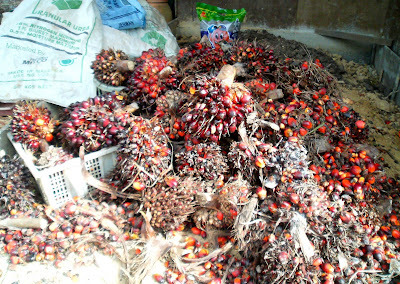 Such is oil palm farming, you need to have patience to accumulate enough quantities to sell the to the millers. Glad you've got returns coming for many more years in your oil palm farming. Happy harvesting!